A new exhibition the Bruce Museum in Greenwich, CT, showcases the extraordinary collection of Chinese tomb sculpture in the Fred and Jane Brooks Collection of the Bruce Museum. Featuring dozens of rare and delicate terra cotta figurines, painted and glazed ceramics, and other antiquities, Buried Treasures of the Silk Road will be on view in the Museum’s Arcade Gallery through June 2, 2019. During the period of peace and prosperity of the Han Dynasty (206BCE – 220CE), considered the Golden Age of China, emissaries ventured from China into Eurasia. Merchants soon followed, laden with polychrome, patterned silk – a luxury never seen outside of China. In time, these merchants transported other exotic goods, including lapis lazuli and other precious metals, furs, and ivory on the backs of camels, donkeys, and horses to ever more distant markets, extending the range of trading partners along the way. Evolving into a network of overland and water routes that stretched thousands of miles across China and Central Asia to Eastern Europe, the Silk Road introduced and formalized the practice of international trade. China's second great empire, the Tang Dynasty (618 CE-906 CE) is considered the Golden Age of Chinese Cosmopolitanism, an era when foreign ideas, products, and religions were welcomed. Tang Emperors reestablished the Han model of control over taxes and tolls along the network of Silk Road markets. Prosperity supported the arts, and multicultural influences created interest in new forms of music, dance, fashion, and artistic expression. Traditional Chinese rites and customs evolved. During both the Han and Tang dynasties, mortuary rites and customs were important elements of Chinese culture. Wealthy citizens expanded on the tradition of furnishing their massive burial chambers with numerous and elaborate art objects. Grave goods, called mingqi or “spirit goods,” indicated the status of the person on earth and were interred for use in the afterlife. The materials and stylistic elements of grave goods reflect the way artists and craftsmen embraced the multicultural influences that entered China via the Silk Road. Buried Treasures celebrates the artistic achievements of anonymous Chinese artists supported by the riches earned on the Silk Road. 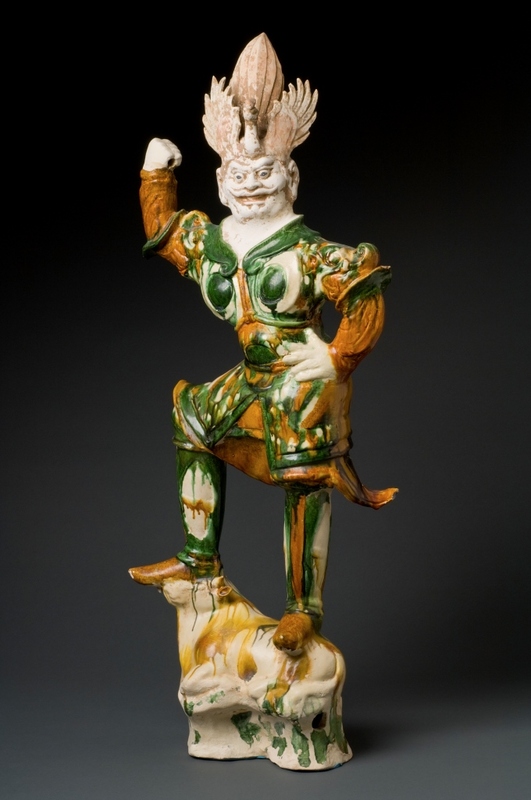 The exhibition also features art objects from the Museum’s permanent collection exchanged on the Silk Road. To complement this exhibition, the Bruce will present a series of docent tours and related programs. Click here for details. The Bruce Museum is grateful for support of this exhibition from The Charles M. and Deborah G. Royce Exhibition Fund and the Connecticut Office of the Arts, as well as for the ongoing generosity of Fred and Jane Brooks in sharing these Buried Treasures with the public. Above image: Lokapala, Tang Dynasty, 618-906. Sancai glazed pottery, 35½ x 15 x 7 in. Gift of Fred and Jane Brooks. Bruce Museum Collection, 2013.15.01.